I rarely eat desserts simply because the amount of sugar in them is way too strong for me. I also don’t make desserts that often, because doing so is way out of my comfort zone. However, after repeatedly seeing the method for making these raw chocolate cups on several other blogs, I decided I’d try to make them myself but scale back the sweetness to create a rich and semi-savory dessert instead. And instead of filling these with peanut butter, I decided to fill these instead with a mixture of raw tahini for richness, ground raw cashews for texture and a touch of raw mellow miso for a hint of saltiness. The end result was a unique-tasting and adorable dessert that was also easy to make in less than 20 minutes. Place the raw cashews into a small food processor and grind into a fine powder. Add in the tahini and water and blend until well-combined. Then add in the miso and blend again. The mixture should be firm like peanut butter and easy to mold into a small disc in your hands. In a small measuring cup, melt the coconut oil in the microwave. Whisk in the chocolate and agave. 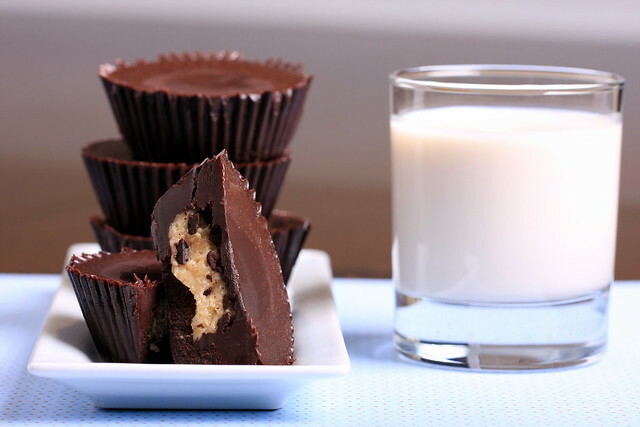 Pour a thin layer of the chocolate into the bottom of 4 cupcake liners. Place in the freezer to set for a few minutes. Miso is perishable, so keep the cups in the refrigerator unless you are serving them immediately. i'm the same way. i don't enjoy sweets and am very much a savory person. Thanks Caitlin! These are fun and easy to make, although it took me a few (undocumented) tries to get it right! I can't imagine putting 4-5 TB of agave in here, but that seems to be the standard. They are savory and melty, and perfect for someone who doesn't like intensely sweet desserts! I was confused by the amount of agave – is it one TB or 4-5 TB? I plan to make these & want to make sure I get that right. Thanks so much for posting, these look amazing!! Penni — I used 1/2 TB of agave, which I thought was perfect, but most recipes call for 4-5 TB — I would just add the agave in by TBs and taste as you go along to create chocolate that has a sweetness level you like! Good luck with the recipe and I hope you enjoy them! Love this – can't wait to try and share with my blog readers at http://www.glutenfreediva.com. Thanks so much for sharing! Your chocolate creations are beautiful! Found your blog through Food Gawker. What an interesting flavor combination, I would never have thought to mix tahini with chocolate but now that I think about it sounds like it would be a nice combo. Thanks Maggie! This experiment has now caused all sorts of crazy filling combos enter my brain. I think I'll be posting about these regularly now! i'm a fan of dessert, i like making it and i like ordering it when out. since going dairy free i have missed the combination of nut butter + chocolate. the filling sounds very interesting. well, I have no problem with crazy sweeties, but I have to say – these sound really interesting and delicious! also, are you going to be at Vida Vegan Con??? We must meet one another!!!! Thanks Amey! Yes, I am going to be at VVC next year, I can't wait … Would love to meet you there! 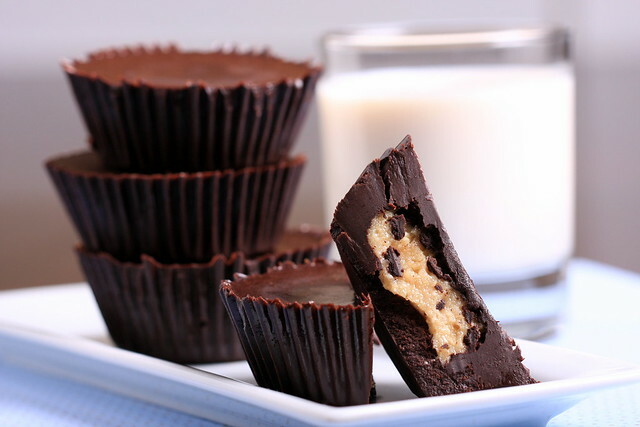 I keep being scared (for some unknown reason) by PB-cup-type-items, but this makes it look so easy (and original). Maybe I'll finally make it happen. Thanks!! I used powder for this recipe – hope you enjoy!